In the last two years, Toyota has been the target of more negative publicity than any auto company in recent years. Some of the fault lies with Toyota, but most of the blame must be on an inept, maybe even deceitful Department of Transportation, a UAW anxious to bloody their longtime nemesis, and a thoroughly gullible press corps. 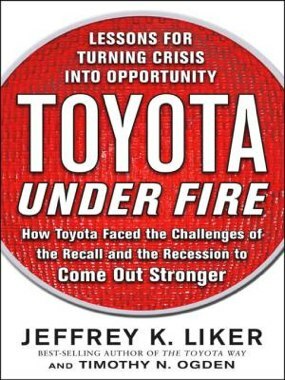 Author Jeffrey Liker is a professor at the University of Michigan, and a longtime observer of Toyota’s business culture, while author Timothy Ogden is a business writer. This book is a study of how Toyota responded to these troubles, in accordance with their longtime guiding principles. Liker points out that a typical company would have responded to these pressures by firing people and announcing a newly formulated strategy for conducting its business in the future. Toyota fired no one. They looked inward to their longtime guiding principles that had made them the manufacturer of the highest quality automobiles in the world. They looked to see how they had departed from their principles, and how they could solve their problems by applying those proven principles. The biggest problem was “unintended acceleration” — cars becoming uncontrollable by their drivers. Most “car people” knew instinctively that the problem was with the drivers who were hitting the wrong pedal. The Audi “unintended acceleration” debacle in the late ‘80s saw the same news media frenzy and reporters’ willingness to believe nonsense. In the end, it was determined that Audi drivers were stepping on the wrong pedal. Toyota could have blamed Toyota owners but they didn’t want to do that publicly. So they endured considerable abuse and mistreatment before they were finally vindicated. Much like Audi – media frenzy, government frenzy, lost sales, damaged reputation. All based on fiction and imagination. A good read. You’ll want to buy a Toyota. Toyota DID blame the customer/driver of their [yawn] boring, unimaginative refrigerators on wheels. I wouldn’t touch one witht a barge pole. You read and reviewed the book. Tell me how you concluded Toyota was vindicated? Much of what Martin states is true,however,Toyota is not a Saint. I understand the vicious dynamic of the press and the presumption of guilt rather than innocence, and unfortunately it is pervasively reflected in our media today. Tragic, and yes we as consumers are gullible. As a dealer, having watched Toyota’s behavior with regards to systemic problems with their cars, as a Japanese culture, they have not been forthright with admitting guilt. This is not uncommon. A good example of this was the engine sludge issue in the 5SFE four cylinder and 3.0 liter engines from 1997 to 2002. Toyota, for months, denied any problems, literally, through the dealer networks accussing customers of not changing their oil frequently enough. Many of these buyers, lost their engines at around the 80K mile mark, having to spend thousands of dollars replacing them. Not good press for Toyota. Ultimately, and yes, through the media, Toyota was exposed having a design issue with these engines, and “stepped up to the plate” in offering a extended warranty, and reimbursing customers for previous repairs. Let’s be frank. Toyota,as with any other car company is susceptible to defects. Have they been exemplary in their behaviour addressing them.? Somewhat, but we have all seen worse. They build a good product and Martin is right in the fact that we as consumers should learn to read between the lines with regards to any negative press disseminated against any automotive car manufactuer.